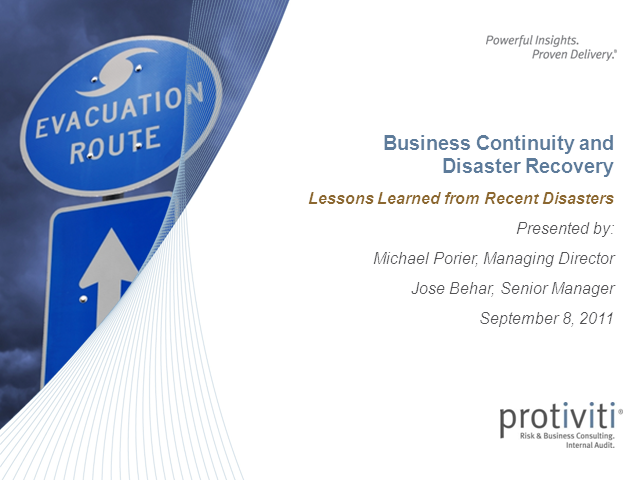 In this webinar, we will discuss lessons learned from a variety of recent disasters. What were the business impacts? What was missing from their plans? What modifications should other organizations make to avoid similar problems? You will receive practical guidance based on specific cases. We will tie each case back to relevant business continuity management concepts and methodologies. This webinar is appropriate for individuals with any of the following responsibilities. Help shape the conversation. Submit questions or topic input via Twitter using hashtag #probcmdr. Protiviti's IT Priorities Survey results reveal 2/3 companies are going through a major IT transformation in 2014. Join Protiviti's IT Consulting managing directors to discuss why. You are invited to register for our upcoming COSO webinar, COSO 2013: Mapping Controls to Principles. Transitioning to the New COSO Framework is top of mind for many organizations. How do you get started? How do you map controls to principles or vice versa? What are some of the preliminary findings organizations are seeing as they head down the path to implement the framework? Please submit top-of-mind questions during the webinar registration process. CPE credits will be provided to qualifying attendees. Please join our webinar on focused on assessing the top priorities for internal audit functions. CPE credit will be provided to qualifying attendees. Protiviti has conducted the second-annual Executive Perspectives on Top Risks Survey. We obtained the views of more than 370 board members and C-suite executives about risks that are likely to affect their organisation in 2014. Join Managing Director, Mike Purvis and Director, Dirk Verwohlt for a discussion of the report findings. Internal auditors play a vital role in their organisation’s strategies and daily activities. Your department’s audit plan should be a well-balanced examination that covers regulatory requirements and aligns key risk areas within the organisation. Join Protiviti's Mark Harrison & Adam Christou, as they help internal audit professionals identify hot topics & emerging trends in 2014 to better execute the department’s strategic focus on risk throughout the year. IT audit is a dynamic area with high personnel turnover, rapidly changing environments and shifting risk profiles. Protiviti's third-annual IT Audit Benchmarking Survey Report analyses the underlying IT audit trends facing our profession today. Protiviti's experts will discuss the current data breach issues and best practices for keeping data secure. Protiviti's BCM experts will share key changes in business continuity management in 2014. With nearly 40 percent of the Dodd-Frank Act yet to be implemented, numerous new consumer protection requirements taking effect this year, and the continued strong focus on anti-money laundering and sanctions compliance, regulatory compliance will remain a major challenge for the financial services industry in 2014. Join Protiviti's Tim Long, Scott Jones, John Atkinson, Steven Stachowicz and Nicole Weber on Wednesday January 29, as they help compliance, risk and internal audit professionals identify some of the important regulatory issues and developments for 2014 that will need to be included in internal audit and compliance programs. We look forward to having you join us. If you have any questions, contact Esther Veenhuizen at 212.708.6350 or esther.veenhuizen@protiviti.com. David Brand, Keith Kawashima and Barbi Goldstein -- Protiviti Inc.
During this webinar, we will continue our conversation on the 2013 COSO Framework. The focus will specifically be on the implications to IT controls. Internal auditors play a vital role in their organization’s strategies and daily activities. Your department’s audit plan should be a well-balanced examination that covers regulatory requirements and aligns key risk areas within the organization. However, in today’s fast changing environment, plans change and the needs of the organization may evolve rapidly. Has your support of the organization kept pace with those changes? Should you make changes to your audit plan to ensure coverage of new risks? Also, do you know what new elements should be included in your 2014 plan? The objective of this presentation is to help internal audit professionals identify emerging trends in need of attention so that auditors can better execute the department’s strategic focus on risk. Internal Auditors are often the first line of defense in a company’s fight against fraud and corruption. Indeed, Internal Auditors are often called upon to “pivot” when a routine internal audit unearths red flags that may be indicators of fraud, corruption or misconduct. As a manager, you are likely adept at handling crises on the job. But how do you handle people in crisis? Whether positive or negative, any life-altering event can affect how your employees work, and as the boss, you may be the last person to know. What can you do to diagnose changes in employee performance before it’s too late? Join Ann Butera, President of the Whole Person Project, Inc. and Protiviti in this webinar to discuss how to mitigate the effects of your employees‘ personal lives on their work lives. We will discuss how the inherent boss/employee relationship can lend itself to misunderstanding, how to recognize the symptoms and warning signs of employees’ crises, and how you can adjust your management style to deal with this. Protiviti's Managing Director Steve Hobbs discusses the current state of the IPO process with NASDAQ Economist Frank Hatheway prior to his Protiviti presentation on October 29th, 2013. NASDAQ OMX Chief Economist Frank Hatheway discusses the IPO pricing process on October 29th, 2013. The World has forever changed. eCommerce is no longer a nice to have…it is a necessity. We live in a very noisy world where technology has changed the way we buy. Time, context and attention are the new currency. Join us for this webinar where Aaron Greenman, Protiviti Director, will explore how technology has had a significant impact on mobile commerce, the security implications involved and measures to consider. Protiviti's PCI Security Experts will discuss recent changes and upcoming developments in data security standards and impact on companies. FEI and Protiviti will jointly present on the findings from Protiviti's 2014 Finance Priorities Survey. Infosec is known for constantly telling IT to "patch your stuff" to prevent getting compromised. Scan reports with a bunch of red are kicked over the wall, and scary reports showing thousands of vulnerabilities are an all-to-frequent result of a vulnerability assessment. But these scan reports are often lying about the true severity of the vulnerabilities, which creates more work for everyone and leaves Infosec crying wolf more often than it should. In this talk, we take a closer look at the problem with vulnerability ratings and how to have IT fail less by having to patch less, while simultaneously being more secure. Protiviti is a global business consulting and internal audit firm composed of experts specializing in risk, advisory and transaction services. Our firm includes leading experts in areas of finance and accounting, risk and compliance, technology effectiveness, litigation, investigations and financial restructuring. Our professionals have powerful insights on par with the largest consulting organizations in the world; however, we are more nimble and adept than these competitors in delivering value for our clients. Protiviti is the leading company dedicated exclusively to risk consulting and internal audit. We help our clients seize new opportunities for growth and profitability while protecting them from their risks. We work with more than 25 percent of the FORTUNE 500®. Our 2,500 professionals in 60 offices worldwide bring powerful insights and proven delivery with a customized blend of competencies to every project.